Auditions open for a limited time! At Music In Common, we believe that everyone is a rock star. Yep, everyone. And that means YOU! We want to put the rock star in you to work this summer to help change the world. At Music in Common, we not only believe that music can change the world, we live it! We are a non-profit organization that empowers youth against hate through collaborative songwriting, multimedia and performance. Our programs bring together teens and young adults from diverse backgrounds to discover and celebrate their common ground. Since 2005, Music In Common has directly served thousands of people in more than 300 communities across the globe and across religious, ethnic, cultural, and racial sectors. In any community, our programs can transform apprehension into trust, fear into acceptance, and powerlessness into action. Working together face to face, participants expand understanding, build confidence, strengthen community, wage peace and - yes - change the world. As musicians and music lovers, we know first hand how passionate you are about music. The way it moves you and transports you to another place. How it expresses your emotions and tells your story. Now, imagine if you could be the voice of hundreds of youth across the globe, many from very different backgrounds than your own and many who may not have the same musical skills as you. The incredibly powerful songs written by these youth in our JAMMS program deserve to be heard and we need your help to do it. 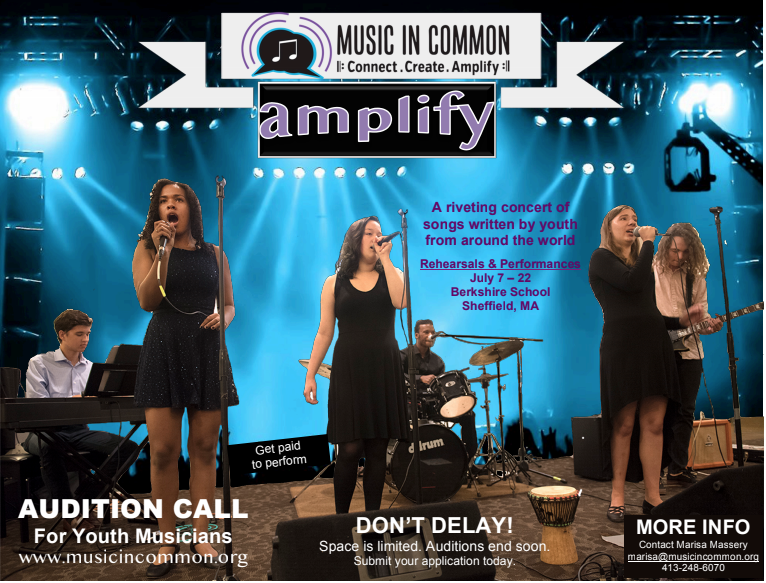 Amplify 2019 is a two-week residential program in which high school and college aged musicians such as yourself have the unique opportunity to work with professional musicians and producers to learn, rehearse, and perform in concert songs written by youth from around the world. In doing so, you’ll learn about the faiths, cultures, and narratives of the youth whose songs you are learning. You will be their ambassadors, amplifying the important messages of their songs to the world via three concerts that will be filmed, recorded, and posted on the Internet. You and your fellow musicians will learn the importance of teamwork, gain self-confidence, and develop strong communication and collaborative skills. You will be the band! encourage anyone interested to audition regardless of ability to pay. To further offset tuition cost, we are pleased to offer a small stipend to participants upon conclusion of the program based upon a percentage of the culminating concert ticket sales. Your participation in Amplify may also be eligible for school credit. All applicants are required to audition via the online application below. Space is limited and auditions end soon so get your application in now. To apply for Amplify 2019 please read and complete the form below.